Most of the theories said – The Barbarian attacks on Rome partially stemmed from a mass migration caused by the Huns’ invasion of Europe in the late fourth century. When these Eurasian warriors rampaged through northern Europe, they drove many Germanic tribes to the borders of the Roman Empire. For years the well-disciplined Roman army held the barbarians of Germany in check. However, when the Roman soldiers were withdrawn from the Rhine-Danube frontier in the third century A.D. to fight in civil wars in Italy, the Roman border was left open to attack. Gradually Germanic hunters and herders from northern and central Europe began to raid and take over Roman lands in Greece and Gaul. In A.D. 476 the Germanic general Odovacar overthrew the last of the Roman emperors and made himself ruler of all Italy. From then on, the western part of the Empire was ruled by Germanic tribal chiefs. Roads and bridges were left in disrepair and many fields were left untilled. Pirates and bandits made travel unsafe. 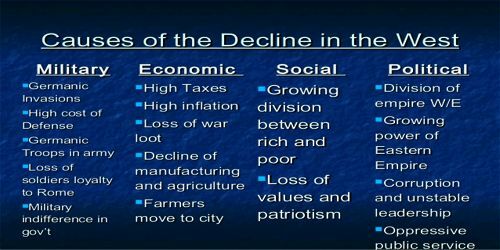 Cities declined and trade and business began to disappear. The final years of the Empire were marked by a decline in morals and values, and some historians believe that this contributed to the decline of the Empire. Crimes of violence made the streets of the Empire’s larger cities very unsafe. According to Roman historians there were 32,000 prostitutes in Rome during the reign of Trajan. Emperors like Nero and Caligula became infamous for wasting money on lavish parties, where guests ate and drank until they became ill. Most important, however, was the growth of the Roman passion for cruelty. The most popular amusement was watching the gladiatorial combats in the Colosseum. These were attended by the poor, the rich, and frequently the emperor himself. As gladiators fought, vicious cries and curses were heard from the audience. One contest after another was staged in the course of a single day. Should the ground of the arena become too soaked with blood, it was covered over with a fresh layer of sand, and the revolting performances went on. 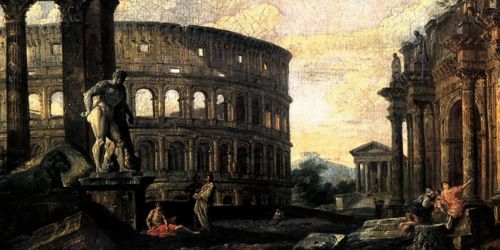 Some historians believe that the fall of the Roman Empire was due in part to environmental and public health problems. They claim the leaders of Rome were killed off by consuming excessive amounts of lead. They argue that since only the wealthy could afford to have lead pipes bring water into their homes and to cook with lead utensils, their death rate was increased considerably. This theory, however, is challenged by those who point out the fact that the eastern part of the Empire survived long after the decline of the Western portion. Maintaining an army to defend the borders of the Empire from barbarian attacks was a constant drain on the government. Military spending left few resources for other vital activities, such as providing public housing and maintaining the quality of public roads. In the latter years of the Empire, frustrated Romans lost their desire to defend the Empire. Thus, the government found it necessary to rely increasingly on hired soldiers recruited from the unemployed city mobs or foreign countries. Such an army was not only unreliable, but very expensive. Thus, the emperors were forced to raise taxes frequently-the majority of which were paid by businessmen and farmers, which hurt the economy. Some historians believe that this helped lead to the fall of the Empire. During the last 400 years of the Empire, the scientific achievements of the Romans were limited almost entirely to engineering and the organization of public services. They built marvelous roads, bridges and aqueducts. They established the first system of medicine for the benefit of the poor. But since the Romans relied so much on human and animal labor, they failed to invent many new machines or find new technology to produce goods more efficiently. As a result of inferior production techniques, the Romans were unable to provide important goods for their growing population. Some historians theorize that this contributed to the downfall of the Empire. The Roman economy suffered from inflation (an increase in prices) beginning after the reign of Marcus Aurelius. Once the Romans stopped conquering new lands, the flow of gold into the Roman economy decreased. Yet much gold was being spent by the Romans to pay for luxury items. This meant that there was less gold to use in coins. As the amount of gold used in coins decreased the coins became less valuable. To make up for this loss in value, merchants raised the prices on the goods they sold. Many people stopped using coins and began to barter (trading goods for goods, rather than using money) to get what they needed. Eventually, salaries had to be paid in food and clothing, and taxes were collected in fruits and vegetables. Some historians argue that this helped lead to the collapse of the Empire. One of Rome’s most serious problems was the difficulty of choosing new emperors. The Romans never created an effective system to determine how new emperors would be selected. For this reason, the choice of a new emperor was always open to debate between the old emperor, the Senate, the Praetorian Guard (the emperor’s private army), and the army. Gradually the Praetorian Guard gained complete authority to choose the new emperor. In return, the new emperor handsomely rewarded the Guard for its support. This system worked fairly well for a time. Beginning in 86 A.D. however, when the army strangled the new emperor, the practice began of selling the throne to the highest bidder. During the next 100 years, Rome had 37 different emperors-2l of whom were removed from office by assassination This political corruption, some historians argue, contributed to the decline of the Empire. Some historians believe that Christianity produced dramatic changes in Roman society at the very time when pressure from the barbarians was increasing. They argue that Christianity made its followers into pacifists (those who oppose war), thus making it more difficult to defend Roman lands from barbarian attacks. They also suggest that the Church attracted many qualified leaders whose talents were needed to deal with the problems of the Empire. Finally, these historians theorize that money that would have been used to maintain the Empire, instead, was used to build churches and monasteries. During the latter years of the Empire farming was done on large estates that were owned by wealthy men who used slave labor. A farmer who had to pay workmen could not produce goods as cheaply as a slave owner could. Therefore, slave owners could sell their crops for lower prices. As a result, many farmers could not compete with these low prices and lost or sold their farms. Thousands of these men filled the cities of the Empire, where there were not enough jobs to accommodate them. At one time, the emperor was importing grain to feed more than 100,000 unemployed people in Rome alone. Some historians believe that this contributed to the collapse of the Empire. Wealthy Romans lived in a domus, or house, with marble walls, floors with intricate colored tiles, and windows made of small panes of glass. Most Romans, however, were not rich. They lived in small, smelly rooms in apartment houses with six or more stories called islands. Each island covered an entire block. 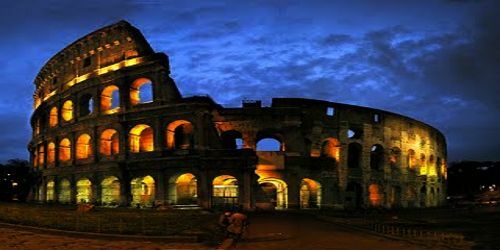 At one time there were 44,000 apartment houses within the city walls of Rome. First-floor apartments were not occupied by the poor since these living quarters were rented out as businesses. The more shaky wooden stairs a family had to climb, the cheaper the rent became. The upper apartments that the poor rented for $40 a year were hot, dirty, crowded, and dangerous. Anyone who could not pay the rent was forced to move out and live on the crime-infested streets. Because of this, cities began to decay. Some historians believe that this helped lead to the downfall of the Empire.